Hamburg - There must have been a point last season when Hamburger SV thought today would never come, but thanks to victory in the relegation play-offs HSV are once again opening their doors for business on Media Day. 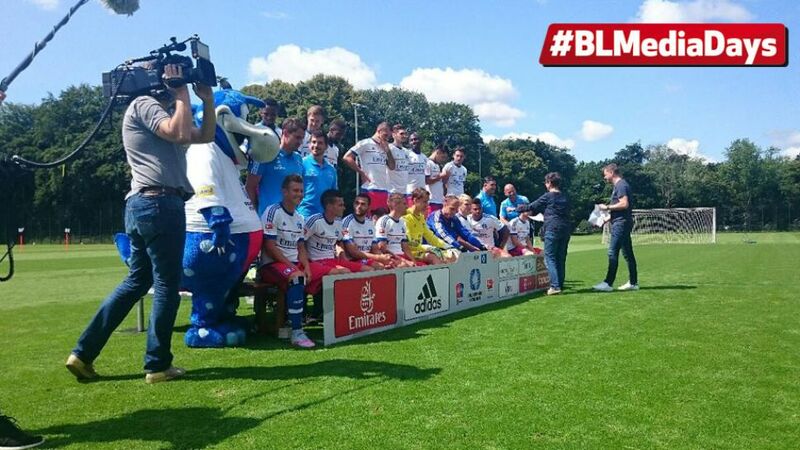 The event, which takes place in and around Hamburg's Volksparkstadion, is used to present the northerners' new signings, take official photographs and produce exclusive media content for use throughout the upcoming campaign. …was undoubtedly the Hamburg mascot. Dino Hermann was the centre of attention at the team’s photo shoot. Every player embraced the mascot, but when it came to the team’s official squad photo, Dino didn’t make things easy for goalkeeping coach Stefan Wächter, who was struggling for space alongside Hamburg’s iconic dinosaur. The statement “hey Dino move over”, soon had the squad in a fit of giggles. Great banter here involving Pierre-Michel Lasogga, Jaroslav Drobny, Johan Djorou and Batuhan Altintas. All four are asked how many times they're going to score in the #Cornerkings challenge, but when the microphone reaches Altintas, who probably doesn't speak any German yet, he says, "I'm from Turkey." First things first: team photo time!